Beetle�s not certain she wants to approach someone. "Oh I can think of any number of other reasons to see him," Starskimmer said grinning, a mischievous glint lighting her eyes as she watched her blushing daughter. �Oh, Mother. I don�t know what you�re talking about!� Beetle tried lying. Beetle could feel the flush creeping down her neck. Recently her mother had been� encouraging� her to approach some of the elders, to experience joining with those who were more experienced. Each time Beetle mentioned spending time with one of those older than her and not in her age range, Starskimmer had hinted that something more could, or should, take place. It was somewhat frustrating, although Beetle knew it was only motherly encouragement. Beetle had experimented with some of the girls nearer her age. Quick Fang was only five, and too young for joining in the furs. Nightstorm and Willow were nearer her age. They were gentle, and the three of them had fun together. She had considered approaching Whispersilk, but something always held her back. She thought that Chicory would be game, but still, Beetle didn�t know if she wanted to know her that way. As for males, the only male even somewhat close to her age was Rainpace, and Beetle wasn�t sure how she felt about him. The next oldest was Greenweave, and she had no interest in him�he was too close to her father for Beetle to feel interest. Fletcher would be a bit closer to her age�but he�d have to come out of wrapstuff. And approaching the elves that were older�male or female�wasn�t something she was inclined to do�yet. Starskimmer had her reasons. She knew her daughter would enjoy it if she would allow one of the older elves to show her a few things. And she knew there was more to joining than Beetle could experience with the females who were closer to her age. She also knew that Beetle would not be rushed, nor would she be cornered. Starskimmer sighed to herself. Beetle was nearing twenty-five turns of the seasons, and she had yet to really grow comfortable as an adult member of the tribe. True, her daughter had taken a very long walk at least ten turns ago, and her daughter had also searched for and found her soul name. She participated in hunts and howls, but she was still so reserved and removed from the rest of the adults. Starskimmer just wanted Beetle to be happy. And she knew that part of that happiness would be found beneath the furs. So when Beetle announced she was going to have Thornbow make a new bow for her, Starskimmer had decided to plant a few ideas. The teasing, yet questioning look on Starskimmer�s face frustrated Beetle, and she turned and headed to where she knew she would find Thornbow. Her mother�s body language had told her that, according to her mother, she needed to take that step into adulthood. �What does sharing furs have to do with all of this anyway? I don�t get it. And why would I have to approach one of them? I�m old enough now� Someone could approach me!� Beetle knew that the others accepted her regardless of whether she shared furs with them, but she also knew that her mother thought she�d feel even more comfortable among the whole tribe if she would get to know them more intimately. That question, �What�s Mother�s secret?� did more to spur her on than any amount of Starskimmer�s teasing. �Why does she enjoy it so much? What am I missing?� All of a sudden, she wanted to know, and she knew that there was only one way to find out. She put her thoughts aside, stood, and finished the distance to where she knew she would find Thornbow. Still going with the intent of obtaining a bow, Beetle was hesitant at the other thought building within her. v She looked up to Thornbow. He was the one who had taught her to shoot, and it was he that encouraged her to practice. He had made her first bow, really just a child�s toy, and since then, he had fashioned others for her as she grew. Now, she wanted something special. She wanted a bow a bit longer than usual, one that she could wear across her back comfortably. She wanted one that would send its arrows true, but with strength and speed. One that she would be able to use fluidly. She wanted one for her as an adult�one that she would continue to grow with, that she would be able to use in turns to come. 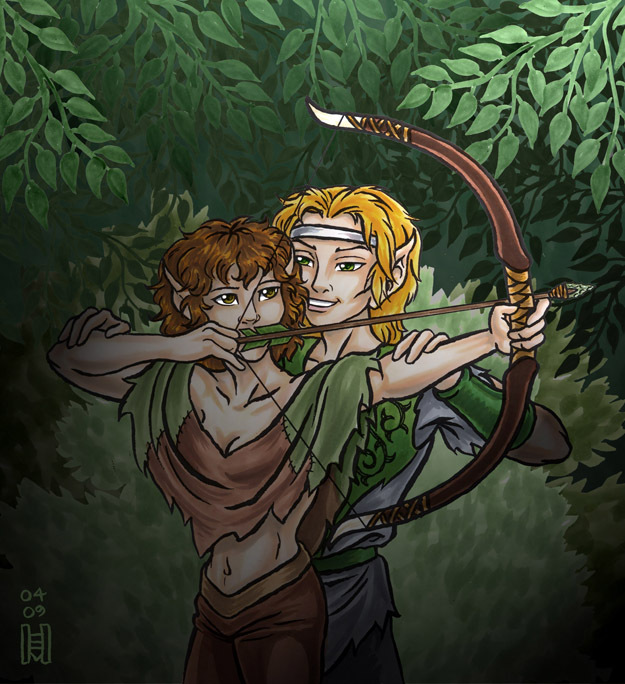 She knew he would be up for the challenge�Thornbow was always striving to make the perfect bow. Well, she would ask him to make the perfect bow for her. After Beetle shared her request, Thornbow smiled at her, happy to have some work to do. Her request wasn�t all that challenging, really, although the idea of the �perfect� bow haunted him with each one that he made. He watched as Beetle slowly examined each of the branches he had hand-picked, wondering which she would choose. He noticed the lines of her hands as she felt the branches, then let his eyes trail up her arms to caress the rest of her body. �She�s grown up!� He mused to himself. Memories of a child running toward him, her makeshift bow in her hands, angry at realizing it was a toy and not a real bow. Memories of the same cub, years later, his arms around hers, teaching her to hold the bow taut before letting it fly. Memories of the not-quite-cub as they hunted�. And now, no longer a cub, the elf lass before him seemed strangely enticing. His eyes traced the curves of her body, his nose took in her scent. He stood and approached her. She had her hands on a branch of yellow and red wood, and as she knelt to pick it up, Thornbow could tell that Beetle was no cub. When she stood, she was surprised by Thornbow�s proximity, and she laughed a little. �I think I like this one. Would it work?� Waiting for his answer and looking at him, she felt� something� stirring within her. �� approach him?� She wondered silently. He reached to take the bow, brushing her hands with his own and thrilling at the light shock he felt. He knew Beetle felt it as well, for there was a bit of crimson flushing her cheeks. He stroked the wood, testing it for strength and flexibility. He smiled, and Beetle knew she would soon have a new bow. Something in his smile also gave her the impression that she�d have something else as well. �Did you bring your old bow?� he asked, his voice a bit more raspy than he�d intended. Thornbow watched as she walked away, admiring her curves and deciding he would approach her�after they finished the business with the bow. When she returned, he pointed to a target and handed her an arrow. She took her time, and he watched with twofold interest as she aimed and as the arrow flew true. She looked at him, her eyes asking if he had seen what he wanted to see, if he knew what kind of bow she needed. They were also asking another question, one he wasn�t ready to answer. He shook his head, then explained that he wanted her to do it again, slowly, and that he would be standing much closer, feeling her tension and release. Beetle nodded. This was similar to previous times when he had made a new bow for her, but for some reason, she knew it was also different. She felt her breathing increase as he stepped behind her, his arms tracing her own as she aimed, pulled the string and released. Thornbow was surprised at the feeling of near-intoxication. Beetle�s scent was strong and sensuous. �Does she know the effect she is having?� He could tell that she did not. Realizing she�d lowered her arms, he found that his own still encircled her frame. Breathing deeply, he knew he could not let go. Opening his senses, he also realized that Beetle was feeling the same thing. Beetle�s body screamed at her. It felt more alive than it had ever felt, and she wondered if this was what her mother had alluded to. She looked up, twisting so that she could see Thornbow. She did not speak, but her desiring eyes met his own. She would not ask, but he knew what she wanted�he did, too. His eyes asked the question, and she nodded. He felt her drop the bow, and he scooped her up, carrying her into his den. Beetle looked at her mother, her face flushing a little. She watched as her daughter headed into her den, then began entertaining ideas of her own. She knew that her daughter would find her way now, and Starskimmer wasn�t thinking about Beetle any more. Instead, she caught the scent of another tribemate and decided to go and have some fun of her own.